According to Jonathan Tamari of the Philadelphia Inquirer, Eagles head coach Andy Reid made it clear that Michael Vick will remain the starting quarterback. 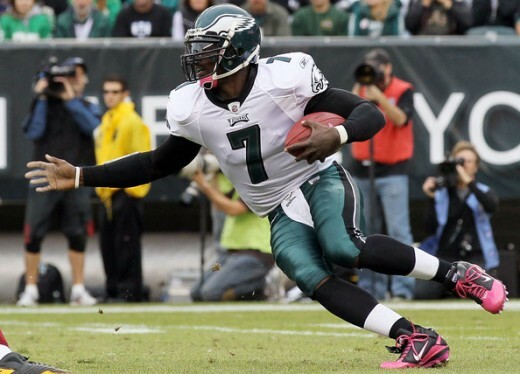 Vick suffered a rib cartilage injury in Sunday’s game against their division rival Washington Redskins. Eagles and Vick fans were looking to see if opening day starter Kevin Kolb would take the starting position back from Vick since he lost the starting job to an injury in Week 1 but that looks like it’s not going to happen. Vick has been nothing short of amazing this season. He brought the Eagles back from a 20-3 deficit against the Packers but came up short losing 27-20. Vick then won two straight games against the Detroit Lions and Jacksonville Jaguars before suffering from the rib injury in the first quarter of the Redskins game.